Maggie's Journal :: Need Meal Time Inspiration? 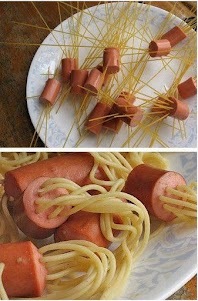 Hot dogs and spaghetti - mustard or marinara? There were no instructions but I think making this exceptional dish is exceptionally easy. Just boil them. You'll have to figure out for yourself how to dress them. Maybe enjoy them plain?